Water damage to your home can be particularly distressing and expensive which is why it is a good idea to be covered by the National Flood Insurance Program, administered by FEMA. They describe their program as, “The National Flood Insurance Program aims to reduce the impact of flooding on private and public structures. It does so by providing affordable insurance to property owners and by encouraging communities to adopt and enforce floodplain management regulations. 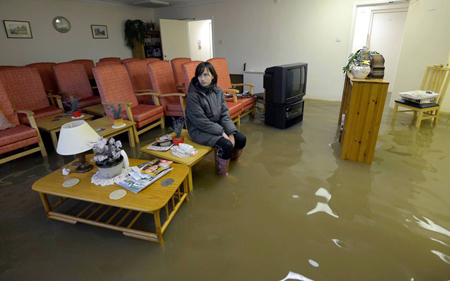 The first type of water damage is caused by nature, which is what the flood insurance covers. There is little you can do to prevent it other than relocating to higher ground or raising your home. The second type of damage is caused by faulty plumbing for the most part, and you can take precautions against this. Fortunately, this type of damage is usually covered by your homeowners insurance. Consult your policy for details. The structure (your home in this case) itself can be repaired to its original condition although the work is an inconvenience. But damage to expensive furniture and family heirlooms are sometimes beyond restoration. A healthy dose of prevention can go a long way to avoiding that headache. Consider the following tips. If you are going away, even for the weekend, consider valving off the water supply outside your home and running both the cold and hot water at the far end of the house. This will take the system water pressure off. Inspect your plumbing fixture supply lines. These dont last forever. If it is time to replace them consider using copper or at the minimum “burst-resistant” braided lines. Some appliances like water heaters have two lines to consider. Replace washing machine hoses at least every five years even if they stand up to a visual inspection. Make sure that the dishwasher drain line between the dishwasher and the garbage disposal is looped high up enough so that sink water does not flow back into the bottom of the dishwasher and overflow. Prevent frozen pipes where they are exposed to cold winter temperatures. If they happen to freeze, know how to thaw a frozen water pipe before it bursts. Be sure that rain water from your roof rain gutters is directed away from your home. Too much water all at once can be problematic for the foundation. If you have standing water issues consider a French drain. Keep your rain gutters clean. This usually means doing a good cleaning once or twice a year depending on the conditions where you live. As a precaution, install gutter guards . The evaporator component of your air conditioner has a drain pan with a drain line routed outside the home. Both the pan and line can be a breeding ground for algae which can plug up the works resulting in water damage. Your service company can ensure there are no blockages and can put anti-algae tablets in the pan to avoid this issue. Inspect your roof twice a year and after any storms for shingle damage and make repairs as needed. Do you have any other tips for avoiding water damage to your home? If so, share them with our readers in the comment section below.